We asked our Honored Guests a few questions. Here's what we heard from Seanan McGuire. "What was your first experience at a science fiction/fantasy con like?" My first real convention was a Dundracon (a gaming convention in San Ramon; it still happens every year) when I was fourteen. I walked through the door, and I was, if not home, at least in the right zip code. I stayed awake for four days, living on soda and bad hot dogs and gaming constantly. I had never been happier. "What makes a convention special to you, and what makes you want to go back?" Oh, man. There are two sides to this: the side that is the con itself, and hence controllable, and the side that is entirely up to the whims of fate. A good, thoughtful, responsive staff, interesting program items, panelists who know what they're doing (which is something the con controls, on at least a macro level), a well-considered schedule, and a rockin' dealer's room will all make sure I have a good time. An intelligent, enforced harassment policy will make the con special. And the people I meet there, the awesome people in the lobby and the bar and on my panels, will elevate that con into something I desperately want to do again. "When you go, do you prefer being an audience member, a panelist, a moderator, or something else?" I'm most comfortable as a panelist at this point, just because it's what I've been doing for so long. I do like to moderate, but I'm happier when I have an awesome moderator and can just go. "Any tips for first time con attendees and/or shy fans?" That feeling you get, that maybe this is home, that maybe you could belong here? It's real. The feeling that follows, the one that says we've all known each other forever and there's no room for you? It's not, not completely. Yes, many of the people you meet will have known each other forever, but we're all here to celebrate loving the same things. There is space for you. We are so glad you're here. Talk to people, or just listen. Respect the needs of others, and make sure they respect yours. Contribute. Absorb. Belong. Welcome. "What is special about genre fiction readers & writers?" This is sort of a double-edged question. On the one hand, they engage with and think critically about the things they love, and that's magnificent. At the same time...so do romance readers. Mystery readers. Goldfish breeders. We are not unique in our ability to get excited; we are human. And that's brilliant. "What projects are you excited to share with FOGcon fans and participants?" "Who would be on your dream panel & what would you talk about?" I'm going to go with "dream," rather than "fantasy," and say that I would love to be on a panel with Charlaine Harris, Catherynne Valente, Amal El-Mohtar, Elizabeth Bear, and Amber Benson, where we would talk about feminism in genre. Once a day, every day, for the whole convention, with something like a drawing or door prizes or whatever to make sure the whole con came at least once. It could be magnificent. 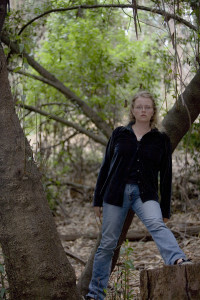 Seanan McGuire also writes as Mira Grant. She is an Honored Guest at FOGcon 2014.